NASA lost direct contact with the International Space Station today (Feb. 19) due to equipment failure, leaving the orbiting laboratory dependent on Russian ground stations for communications with Earth, space agency officials say. The communications loss occurred at 9:45 a.m. EST (1445 GMT) as flight controllers at NASA's Mission Control atthe Johnson Space Center in Houston were sending a software update to the space station. All six space station astronauts are in good health, and NASA is attempting to reestablish a connection with the station, NASA officials said. The space station is currently home to three Russians, two Americans and a Canadian astronaut. 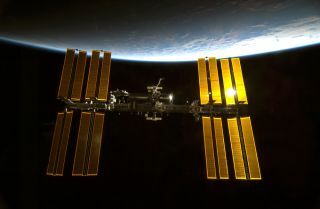 As far as NASA officials can tell, the space station's loss of communications was unrelated to the software update, Kelly Humphries, a public affairs specialist at NASA told SPACE.com. It was a coincidence that the space agency lost contact with the station as the computers were being updated. A main data relay system malfunctioned, and the computer that controls the station's critical functions switched to a backup, NASA officials said in a statement. However, the station was still was unable to communicate with the Tracking and Data Relay satellite network that serves as the outpost's link to NASA's Mission Control center on the ground. "Mission Control Houston was able to communicate with the crew as the space station flew over Russian ground stations before 11:00 a.m. EST and instructed the crew to connect a backup computer to begin the process of restoring communications," NASA officials explained. When mission control made contact with the International Space Station via Russian ground stations earlier today, Expedition 34 commander Kevin Ford reported on the health and status of the space station and its residents. "Hey, just FYI, the station's still fine and straight, everybody is in good shape of course," said Ford in audio released by NASA. "And nothing unexpected other than lots of caution warning tones, and of course we have no system in sight. We'll get that back to you as soon as we can." This is not the first time mission control has lost direct communication with the orbiting science laboratory. In 2010, the space station briefly lost communication with the gound when a primary computer failed and the backup had to take over. Communications were out for about one hour before NASA restored the connection. The International Space Station is a $100 billion laboratory in space that is about the size of a football field. It has the living space equivalent of a five-bedroom home and was built by five difference space agencies representing the United States, Russia, Europe, Canada and Japan. This story was updated at 12:50 p.m. ET to include new details about the communications failure.